Sit, Stay, Squat! 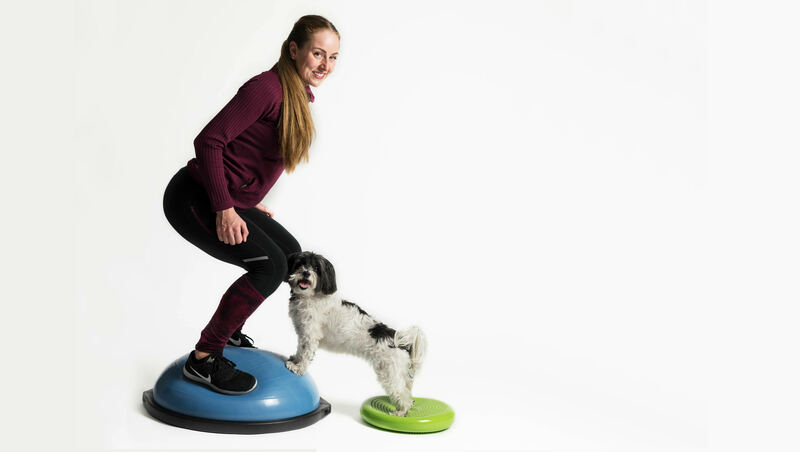 Join Edmonton’s first K9 Fit Club Master Trainer, Sarah Keller, as she demonstrates her workout class Sit, Stay, Squat, a fun circuit training exercise program that addresses the fitness needs of both you and your dog! Lets face it, most people don’t get nearly enough exercise – and there is a strong correlation between human and pet obesity. Our dogs rely on us to provide them with the best possible care, but between our own hectic lifestyles and Edmonton’s cold winters, it can be tough to get them out for a daily walk. Besides, the components of physical fitness for both dogs and humans goes far beyond just walking. A well designed fitness program will include elements of strength, core stability, flexibility and endurance. Together, these components support our entire body while increasing metabolism and preventing disease & injuries. Sarah’s unique class is able to address the needs of both species, and even enriches the dogs mind through the mental stimulation of learning new tasks. On top of it all, training together in this way is extremely reinforcing to the bond between human and canine.